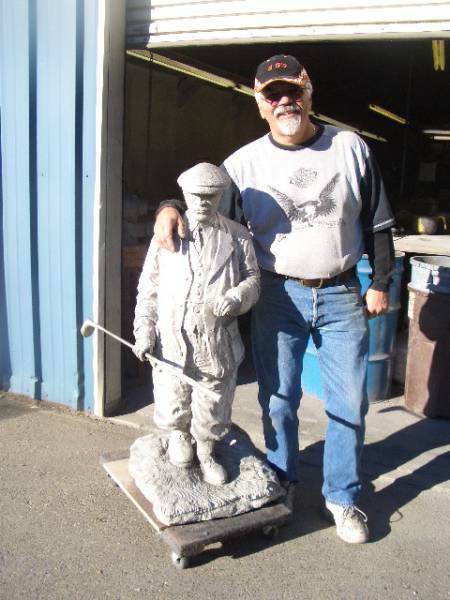 Baker Art Foundry has changed its style of work over the last 41 years, but never has the quality or integrity of the pewter casting process been compromised. We use a lead-free pewter alloy of the highest quality. We use two types of pewter casting: a gravity fed process that allows us to pour the molten pewter directly into the rubber molds, and a centrifugal pewter casting process that allows us to cast in multiples of small items in one mold. George Kysor is our master mold maker as well as our resident artist. We have many artists available should the client need to have a model made. 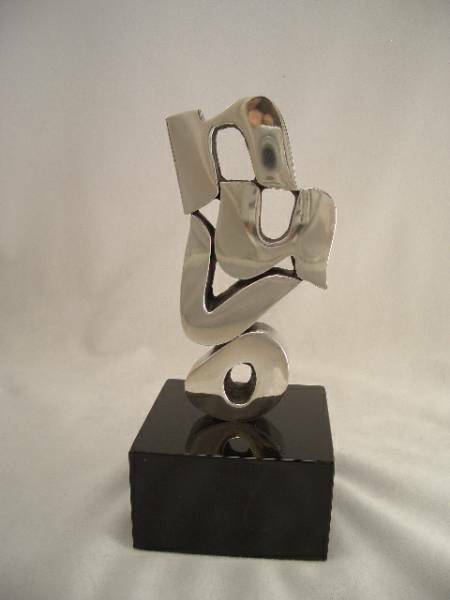 We accept models that our clients have designed in different types of medias: ie: clay, sculpey, wax, wood, metal, etc. While working in clay, it is important for our clients to use a non sulpher material. George will then make the mold of the model and we will begin our pewter casting. 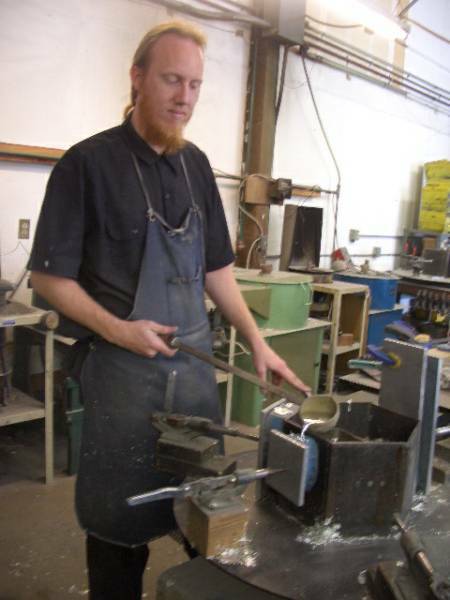 We prefer to make the molds here at the foundry rather than using existing molds. 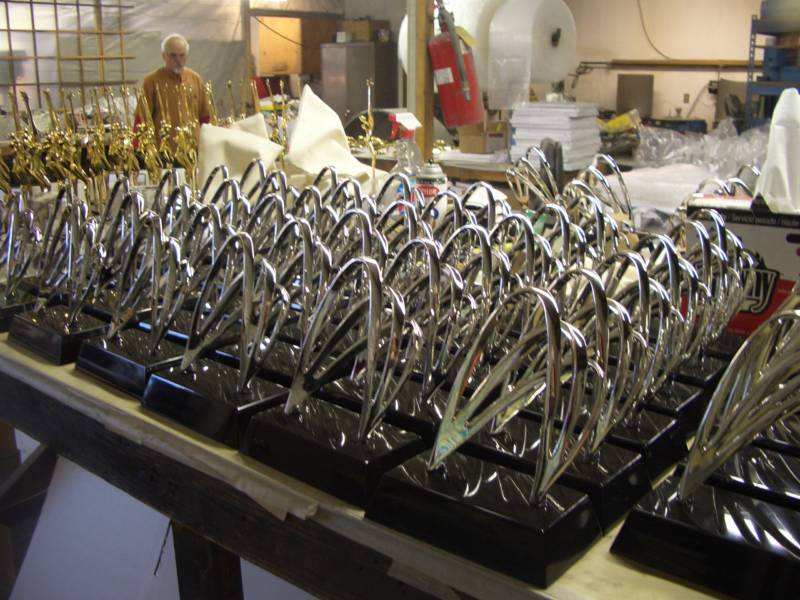 We know if we use our own molds we will be getting a cast product in pewter that will not incur additional finishing time that would in turn cost our customers more money. We maintain the molds here at no charge to the customer. If we are casting so much that there is wear on a mold we will replace that mold at no charge to the customer. 14 kt gold, silver, bronze, copper, nickel, and chrome. These plated finished are electroplated over the finished pewter casting. The above photo's show the foundry in motion...also a picture of George with a 200 lb pewter casting of Alister Mackinzie, by artist Jim Fitzpatrick. The picture to the right shows a sample of our satin pewter finish.